LOUIS "SATCHMO" ARMSTRONG (1900-1971) Perhaps the most influential figure in the history of jazz, Armstrong first learned to play the cornet in a New Orleans reform school. Shortly after his release at age fourteen, Armstrong received his own instrument and formal instruction from his long-time mentor Joe "King" Oliver. In the early days of his career, Armstrong played with Oliver's and Kid Ory's New Orleans groups and with Fate Marable's band in St. Louis. 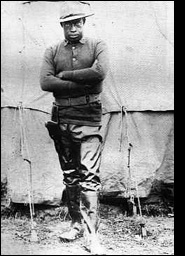 By 1922, Armstrong joined the migration North. He moved to Chicago to join Oliver's Creole Jazz Band, but in short time, he left his mentor to establish a prolific, independent career. From New York to Los Angeles, Armstrong worked with a number of preeminent jazz bands and Blues singers. His recordings and show tours marked jazz music's shift from a regionally-rooted art form to a national production. By the late 1930s, the Louis Armstrong and Orchestra band ushered in the Siwng Era and Armstrong became one of the first early jazz musicians to attain national stardom. Despite the shift in public taste during the 1940s and 1950s, Armstrong maintained his national position until his death in 1971. LEON "BIX" BEIDERBECKE (1903-1931) Born in Davenport, Iowa, Beiderbecke was one of the leading jazz figures from the Midwest. Influenced by the Original Dixieland Jazz Band, the self-taught cornet player and pianist launched his career with the Wolverine Orchestra after his expulsion from military school. 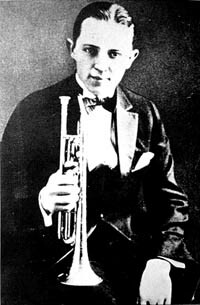 Though he never learned to read music well, Beiderbecke's legendary tone later helped him secure soloist positions with popular Jazz Age bands, including Paul Whiteman's Orchestra. His piano masterpiece, "In a Mist," was recorded in 1926. Beiderbecke was a victim of the age, however, and his alcoholism cost him both his career and life. In 1931, Beiderbecke, 28, died during an alcoholic seizure. His legend has continued to grow since his death. LT. JAMES REESE EUROPE (1881-1919) The son of musicians, young Europe first studied violin with Enrico Hurlei, the assistant director of the Marine Corps Band in Washington, D.C. Nearly ten years later, Europe, at age 22, was a featured pianist in a New York caberet. After serving as musical director for Shoo-Fly Regiment (1907) and Mr. Lode of Coal (1909), Europe founded the Clef Club in 1910. Unique among African American organizations of its time, the Clef Club was both a fraternity and a union that established its own club and booking office. In 1912, the Clef Club Orchestra made the first of three appearances at Carnegie Hall. Shortly thereafter, the famous New York Dancers, Vernon and Irene Castle, hired Europe as their band leader. Before his resignation in 1914, Reese had helped the Castles popularize the fox trot. Europe enlisted as an army private during World War I and helped form a military band as a combat unit. (In 1918, this band was the first African American unit to enter France.) After introducing jazz abroad, Europe and his band returned to New York in 1919 to begin a United States tour. On the night of the final concert, Europe was stabbed and killed by his drummer. Though his career was ended abruptly, Europe left an indelible impression on early jazz music. Notably, on the day following his murder, the papers announced: "The Jazz King is Dead." LILLIAN HARDIN-ARMSTRONG (1898-1971) The leading pioneer for women in early jazz, Hardin, a Fisk University graduate, was a pianist and composer for most of the important jazz bands from New Orleans. After playing for a time with Sugar Johnny's Creole Orchestra and Freddie Kennard's Original Creole Orchestra, Hardin joined King Oliver's Creole Jazz Band in Chicago. In 1924, she married the band's newest member, Louis Armstrong. 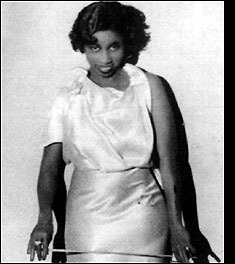 After encouraging Armstrong to step out on his own, Hardin was a leading contributor to her husband's Hot Five and Hot Seven recordings. During the 1920s, Hardin also led her own band at Chicago's Dreamland Cafe. Following her divorce from Armstrong in 1938, Hardin made a number of apperances in Broadway shows and worked as a Swing vocalist. Hardin returned to the Chicago nightclubs in the 1940s and continued to record into the 1960s. She died in 1971 during a memorial concert for Louis Armstrong. JAMES FLETCHER HENDERSON (1897-1952) A chemistry and mathematics major from Atlanta University, Henderson turned to professional music after failing to find work as a chemist in New York. 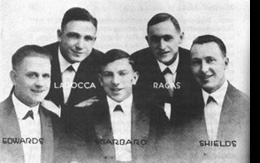 After distributing music and managing the Black Swan Recording Company, Henderson organized and led a jazz band at the Club Alabam. In time, he hired the saxophonist Coleman Hawkins and the leading trumpet player Louis Armstrong. After his first orchestra disbanded in 1939, Henderson became the first black pianist and arranger hired by a white band, the Benny Goodman Orchestra. With Goodman, Henderson helped create one of the most popular bands of the Swing Era. Henderson continued to arrange for the Goodman Orchestra and tour with Ethel Waters until a crippling stroke in 1950. FERDINAND "JELLY ROLL" MORTON (1890-1941) Having worked alternately as a gambler, pool shark, pimp, vaudeville comedian, and a pianist, "Jelly Roll" Morton (born Ferdinand Joseph LaMenthe) is perhaps the most colorful figure in the history of early jazz. Born into sophisticated Creole culture, Morton received classical piano training as a child, but he launched his career in the whorehouses and bordellos of New Orleans. Travelling through the South and the Midwest, Morton worked as an arranger and pianist for jazz bands in Chicago, St. Louis, and Los Angeles. Along with his solo work, Morton made a number of recordings with the Chicago Red Hot Peppers in the late 1920s. Morton's style was distinctive in its blend of jazz and ragtime. As Swing came to dominate the jazz scene in the 1930s, however, Morton was eclipsed by popular artists like Louis Armstrong. He moved to Washinton, D.C., where he worked in small clubs until his death in 1941. JOE "KING" OLIVER (1885-1938) Raised in the musically-vibrant New Orleans, Oliver first learned to play trombone, then switched to the coronet--an instrument he famously used to produce a wide range of "hot jazz" sounds. 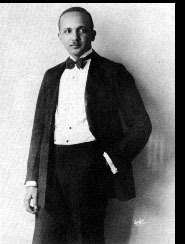 After working with a number of marching bands in New Orleans, Oliver, dubbed "King" by fellow bandleader Kid Ory, moved to Chicago in 1919 to play with Bill Johnson's Original Creole Orchestra. By 1922, he had established King Oliver's Creole Jazz Band and invited his protege Louis Armstrong to join him from New Orleans. As jazz historians would later note, Oliver's band marked a milestone in jazz music, for, in short, the group introduced Amstrong's playing to the world. The Creole Jazz Band eventually disbanded in 1924, and Oliver went on to make recordings with Jelly Roll Morton and the Dixie Syncopators. While Armstrong continued to rise in fame, however, Oliver quickly lost his position in the jazz world. He died in 1938 as a poolroom janitor. In 1917, the Original Dixieland Jazz Band (ODJB)--including cornetist Nick LaRocca, clarinetist Larry Shields, trombonist Eddie Edwards, pianist Harry Ragas, and drummer Tony Sbarbaro--made the first jazz record ever released. Though the racial climate of early twentieth-century America enabled the white band to achieve this milestone before any African American artist, the ODJB's recording did introduce a black-derived sound to a national market. In turn, with the release of "Livery Stable Blues" and "Dixie Jass Band One Step," the ODJB's success marked the beginning of the "Roaring Twenties." Like the number of African American and Creole musicians who influenced the band's musical style, the ODJB formed in New Orleans and migrated to Chicago and New York. After hit success in the United States, the band toured and recorded in London. Shortly after returning to America, however, the band lost its public support. The group disbanded in 1925, but rejoined in the 1940s to record V-discs during World War II. 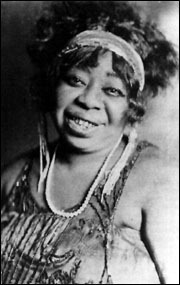 GERTRUDE "MA" RAINEY (1886-1939)Following the tradition of her showbiz family, Gertrude Pridgett, the future "Ma" Rainey, began her musical career in minstrel shows. In 1900, she first appeared singing and dancing on the vaudeville stage. Two years later, she married William "Pa" Rainey and became known as "Ma." With their song and dance act, the couple toured the South with Tolliver's Circus, The Musical Extravaganza, and the Rabbit Foot Minstrels. 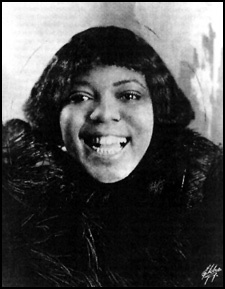 "Ma" Rainey befriended the young singer Bessie Smith during this time. After launching a solo act with the T.O.B.A vaudeville circuit, Rainey, the "Mother of the Blues," signed a recording contract with Paramount in 1923. Accompanied by such noted jazz musicians as Louis Armstrong, Fletcher Henderson and Coleman Hawkins, Ma Rainey recorded 100 songs in the 1920s. BESSIE SMITH (1895-1937) Born in Chattanooga, Tennessee, Bessie Smith began her career traveling through the South in tent shows and bars. Sometime near 1919, Smith was discovered by Ma Rainey and subsequently received training as a blues singer. In the early 1920s, Smith and Rainey were the most popular Blues singers in the vaudeville circuit. In 1923, after moving to Philadelphia, Smith made her first recording, "Down Hearted Blues," with Columbia Records. The record sold more than 750,000 copies the first year, and Smith became one of the most popular stars of the 1920s. Throughout the decade, Smith recorded with a number of noted jazz musicians, including Fletcher Henderson and Louis Armstrong. With the rise of the Classic Blues style of the 1930s, however, Smith's popularity began to wane. After Columbia Records ended her contract, Smith recorded for the last time in 1933. Hoping to recast herself as a Swing musician, Smith returned to the South where she continued to enjoy a large following. Yet in 1937, Smith's career was cut short by a fatal car accident. Over a half-century later, the rumor persists that Smith was denied the medical treatment that could have saved her life because she was black. WELDON "JACK" TEAGARDEN (1905-1964) Following his travels through the Southwest, Teagarden, a self-taught trombonist, arrived in New York to make his recording debut in 1927. In short time, Teagarden was highly regarded for his melodic playing style and for his singing voice. He has been remembered by a number of jazz historians as the best white jazz singer of his time. Teagarden recorded with a number of jazz groups throughout his career, including the Roger Wolfe Kahn, Louis Armstrong, and Paul Whiteman Orchestras. After leaving Louis Armstrong's All-Stars, Teagarden directed a Dixieland sextet for the remainder of his career. He toured the Far East and appeared in a television recording session before his death in 1964.